So where is Cyprus exactly? Cyprus, also known as Aphrodite's Island is located at the crossroads of Europe, Asia and Africa. Situated in the north-eastern corner of the Mediterranean Sea, 75km south of Turkey, 90km west of Lebanon and Syria north of Egypt and 380km and east of the Greek island of Rhodes. Cyprus is the third largest island in the Mediterranean after Sicily and Sardinia, with an area of 9.251 sq km. Your never far away from the beautifully clear Mediterranean sea. This island of Aphrodite is almost completely surrounded by coastal valleys where the soil is very fertile, making it suitable for agriculture. The red soil is incredibly rich and red, almost beyond belief. The island's Flag came into use in 1960 when it was proclaimed independent. The flag features a map of the island and two olive branches beneath which is a symbol of peace between the Turks and Greeks. The white background also symbolizes peace. The copper-yellow colour of the Island's Map symbolizes the large deposits of copper ore found here. Aphrodite's island is sun drenched almost all year round - at least 300 days of sunshine. Reported recently to have the most sunshine in the European Union. Its landscape is a mix of several contrasts. 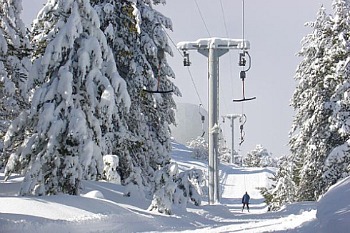 Sandy beaches, beautiful forests and mountains such as Troodos mountain, which offers skiing in Winter and beautiful picturesque hillside villages. The weather here is well known as one of the healthiest climates in the world. Your guaranteed sunshine most of the year. The beautiful beaches and shimmering sea are so inviting. Enjoy sunbathing, swimming and the many water sports on offer. Why not bring a barbeque and a bottle of wine… Yes Please!! Winters here are very short and the temperature rarely falls to single digits. Wearing heavy clothing in winter is also rare. Troodos - what an amazing view!! troodos amazing scenery and snow! It is so awesome to view Troodos from sea level, where the sun is dancing on the water. Look up towards Troodos in the winter time and you will be amazed to see snow covering the mountain top. It’s one aspect of Aphrodite's Island that is so unique. The capital of Cyprus is Nicosia, Europe’s only remaining military divided city. It is also one of the world’s oldest cities around 1000 years old… located in the centre of the island. When the island was invaded by Turkey in 1974, and as a result divided, Turkey claimed the north. Consequently, Nicosia being located in the middle of the island, was divided. Nicosia’s main shopping centre, Ledra Street is where the division slices through this area. It’s a very interesting and much visited area of the capital. The Greek southern area is officially named the Republic of Cyprus and is recognized internationally. There’s no doubt, whether you’re visiting the island for the first time or have just moved here, this 1000 year old capital is a must see. Take in the culture, history, the ancient monuments, unique places of interest and the contrast of the present Nicosia, known widely as a dynamic metropolitan city. At the gateway of several continents and once you've visited, it may be located in your heart for ever. Just like it is for us. I hope you enjoyed this where is Cyprus information. It truly is worth a visit. You'll find lots of accommodation to suit every budget from 1-5 star. Find a hotel in Cyprus to suit you.